Last summer, CCM launched their all-new Jetspeed line of skates. At the top of the line, a new pair of skates featuring one-piece construction and a composite boot. Dubbed the Jetspeed FT1, would these skates live up to the hype? We were fortunate enough to receive a pair of Jetspeed FT1 skates from our friends at CCM to put through our review process. Read on to find out what we thought in our CCM Jetspeed FT1 skates review. The CCM Jetspeed FT1 skates feature a terrific design, continuing with the black and red color scheme that was found on previous generations of Jetspeed skates. 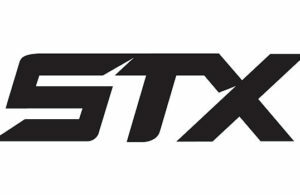 The quarter package is constructed CCM’s Rocket Frame composite with L1TE frame 360 technology. This true one-piece setup allows for removal of the outsole, which in turn enhances energy transfer as well as responsiveness. The technology was six years in the making and is a huge part of the FT1 design. In addition to the improvements in efficiency, the new L1TE frame 360 setup also helps to provide a more true anatomical fit which wraps around your foot and hugs it closely. This design helps to eliminate negative space between your foot and the boot which will ultimately improve your skating. CCM also enhanced the Rocket Frame with their SpeedCore III setup. This inner core helps to increase rigidity and stiffness in the boot, leading to more explosive starts. The core is also fully thermoformable, leading to a more customized fit around your foot. The tongue and liner are built with top of the line materials as well. This includes a Total Dri Pro liner with strategically placed DuraZone abrasion patches for added durability and a 7mm two-piece white felt tongue with injected HDPE foam for enhanced protection. Beneath your foot, CCM continues to offer custom footbeds, which is a nice touch. The Jetspeed FT1 skates have custom support insoles powered by Currex. The insoles are arch specific and help to increase the contact area between midsole and bottom of the foot. This not only helps with comfort but improves performance on the ice as well. CCM also brought back the SpeedBlade 4.0 holders as well as the SpeedBlade Hyper-glide runners. 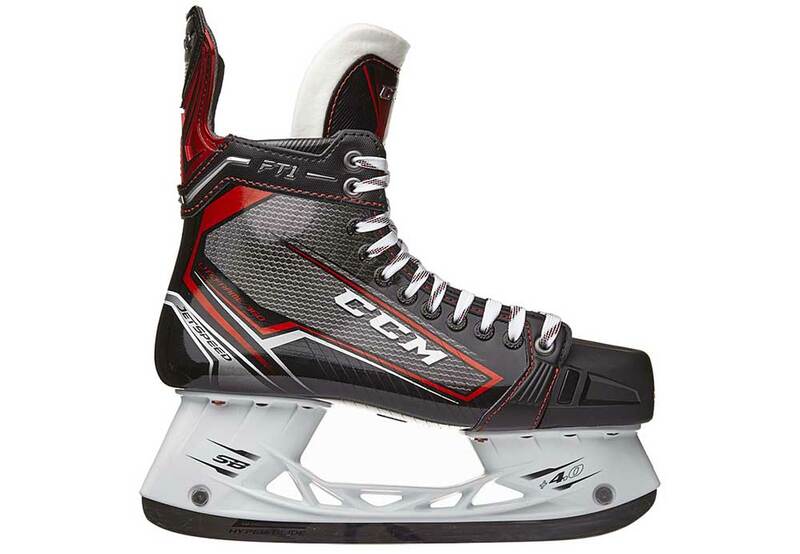 The CCM Jetspeed FT1 skates are described as having a tapered fit. They offer a low-medium volume, narrow-medium forefoot, and a narrow heel with anatomical heel lock. For my skates, I went with a size 9.5EE. In just about every other pair of skates on the market, I wear a 9.5D. With the Jetspeed, knowing how narrow they were, I went with a wide version to better accommodate my foot shape. For the most part, the sizing was pretty well to my liking. However, even the EE width was still a very snug fit on the sides of my foot and felt a bit too tight at times. Without hesitation, I can say that performance from the CCM Jetspeed FT1 skates is off the charts. Their one-piece technology and 360-degree wrap around your foot is something that you really have to try in order to appreciate. Using the skates for the first time reminded me of when I first used a skate with a composite quarter package and outsole. You notice the improvements in energy transfer with each and every stride and feel like you have a better connection with the ice beneath you. Now, several years later, the technology has developed once again. This time, the one piece boot construction and elimination of the outsole offers this new level of responsiveness and control out on the ice. Each stride offers incredible feedback and allows you to perform at a new level. With a minimal amount of negative space due to the 360-degree fit, you can also tell that you’re maximizing energy return from each and every stride. The incredible energy return and power generated from each stride also comes from the SpeedCore III within the RocketFrame. The stiffness and rigidity offered in the quarter package helps to enhance acceleration and let you hit your top gear much quicker. This really comes in to play when racing for loose pucks, and sometimes those first few steps can make all the difference. What really blows me away about many skates today, and the Jetspeed FT1 are certainly among the leaders here, is that the manufacturers manage to pack in all these incredible features and still somehow make the skates extremely comfortable. Despite being a bit too narrow for my feet, the CCM Jetspeed FT1 skates still managed to deliver in the comfort department and are skates that I really enjoyed using. It’s hard to imagine how a pair of hockey skates could get much better. I’m sure it will be done, but even a year after their release, I can confidently say that the CCM Jetspeed FT1 skates are some of the best skates available today. Everywhere from performance to comfort and even to protection and durability, the Jetspeed FT1 skates have met or exceeded my expectations. If you have the budget, the right foot shape, and want the best performing skates on the market, you may not need to look any further. The CCM Jetspeed FT1 skates will fit your needs and I would not hesitate to recommend them. The CCM Jetspeed FT1 skates are currently available and can be purchased from our friends at IceWarehouse.com. They retail for $899.99 and will ship for free. If you’re convinced and are ready to pick up a pair, head over to Ice Warehouse to order today!